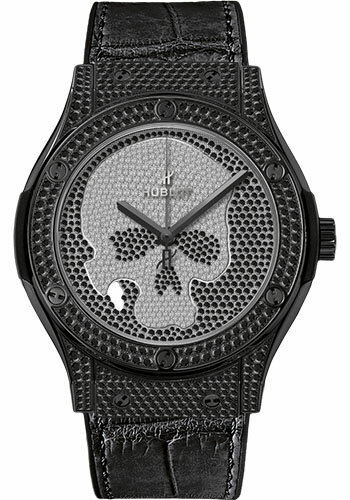 45 mm polished black PVD titanium case set with 218 diamonds (~1.41 cts), polished black PVD titanium bezel with 6 H-shaped black PVD titanium screws and set with 126 diamonds for 1.41 cts, sapphire crystal with anti-reflective treatmentand Hublot logo printed on the inner side, black PVD 18K white gold dial dial set with 824 white and black diamonds for 2.19 cts and polished black-plated hands, HUB1112 self-winding movement, approximately 42 hours of power reserve, black rubber and rub off alligator strap, black PVD stainless steel deployant buckle. Water resistant to 50 meters. 45 mm polished titanium case with 218 diamonds for (~1.41 cts), polished titanium bezel set with 126 diamonds for (~1.41 cts) and 6 H-shaped black PVD titanium screws, sapphire crystal with anti-reflective treatmentand Hublot logo printed on the inner side, 18K white gold dial set with 824 white and black diamonds for (~2.19 cts), and polished rhodium-plated hands, HUB1112 self-winding movement, approximately 42 hours of power reserve, black rubber and rub off alligator strap, stainless steel deployant buckle. Water resistant to 30 meters.